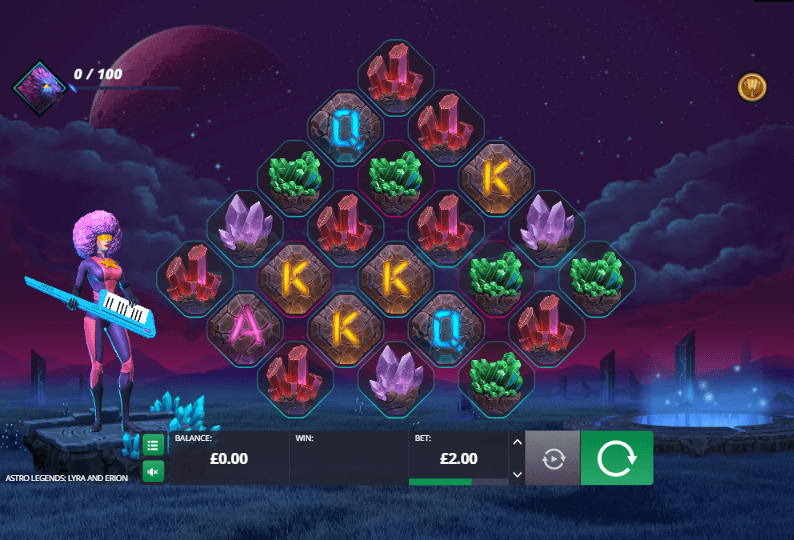 Combining science fiction and 1970s funk music in a really groovy setting, Astro Legends: Lyra And Erion is a UK online slot game from developer Foxium. While the basic format of the game should be familiar to anyone who enjoys playing fruit machines, the setting of this game is freakier and funkier than many of the other games out there. Make sure you’ve got your afro comb and your platform shoes ready if you fancy a shot at this one! The setting for this game is certainly original, with players entering the universe of Oratorio, and following the adventures of a character called Lyra. She is the front woman of a band known as the Astro Legends. She is not merely a musician, however, as she also has to save the universe from an evil intelligence called Erion, who is based on the planet Libretto. Everyone dresses in a very funky, 1970s American street style in this universe, with purple, light blue and gold the dominant colours. The game has a cluster pay feature, with the reels set out slightly differently to more conventional online casino slots games. There are no pay lines, with symbols falling into clusters on a field of 22 crystal cells. While this sounds complicated, it all makes sense when you play the game, and is actually really simple. 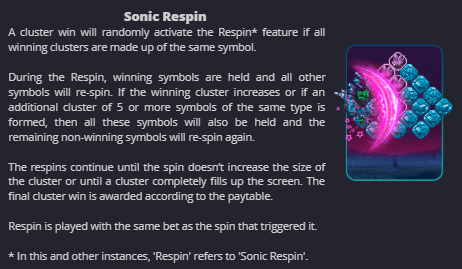 Special symbols include the Multiplier Wild symbol, which boosts payouts from 2x to 5x, and the Stardust Bubble, which is used to trigger the Lyra Spirit Bonus. This turns Lyra into wolf, and you must steer her through a choice of three paths, where she can collect magic crystals. These can boost your bet by up to 20x. Check out more like this at https://www.slotsbaby.com/. Astro Legends: Lyra and Erion comes from Estonian games developer Foxium. Founded in 2015 in Tallinn, this developer likes to build its games around strong narratives and easily recognisable characters. Many of its games are set in strange worlds, and they certainly like to appeal to the imagination of the player. While Astro Legends is set in outer space, other settings for Foxium games include a Miami nightclub, the deep jungles of the Amazon rainforest and a vampire-infested version of Las Vegas. These games are written using HTML5, allowing them to be played on devices of any size. If you like the 1970s, slot city games and science fiction, this is the perfect slots online game for you. Making full use of a futuristic setting, the game also employs an innovative cell structure rather than conventional winning lines, adding to the sense of space weirdness.. If going in quest of stardust so that you turn the main character into a wolf so that she can escape from an evil Artificial Intelligence doesn’t get your imagination firing, nothing will!